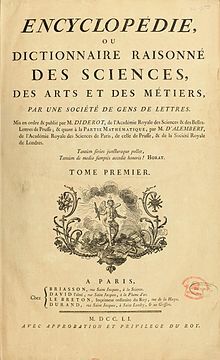 Encyclopédie collaborative translation project, currently contains a rather small but growing collection of articles translated into English (1,217 articles as of January 17, 2011). The Encyclopedie, discussion on the BBC Radio 4 programme In Our Time, broadcast on October 26, 2006. With Judith Hawley, Senior Lecturer in English at Royal Holloway, University of London, Caroline Warman, Fellow and Tutor in French at Jesus College, Oxford, David Wootton, Anniversary Professor of History at the University of York, and presented by Melvyn Bragg. หน้านี้แก้ไขล่าสุดเมื่อวันที่ 7 พฤษภาคม 2561 เวลา 04:55 น.